So yesterday we discovered that the profit in the last two years from Nicky Henderson's hurdlers all came from just two jockeys. Today I want to look at race courses to see if the profit is coming from favoured tracks and first off I'm going to look only at the rides of Barry Geraghty. The reason for this is that he takes the majority of the rides at the Henderson yard and if we could find some profit from his rides we would have a larger sample. The trouble, I imagine, when you are a stable jockey is that you ride everything that you are available for so that has to include a lot of horses that have little chance of winning. So what we need is some other indicator of when a horse has a chance because I'm sure Barry is as good as McCoy, but McCoy is called in when an owner wants somebody special, so that is an indicator itself that the horse has a solid chance. I don't think that particular race tracks is the key we're looking for to unlock the profits from Barry Geraghty rides, so if you have a suggestion on what might be then drop it in the comments. But for now we'll look at courses and see where that gets us. The table below shows Barry Geraghty rides on Nicky Henderson trained hurdlers since January 2013 broken down by course and only showing those where there have been more than 10 runs. Ok we can see that there are very impressive strike rates at the bottom four courses and strong profits at three of those so maybe that is a system itself? Next I'm going to look at courses for all jockeys. 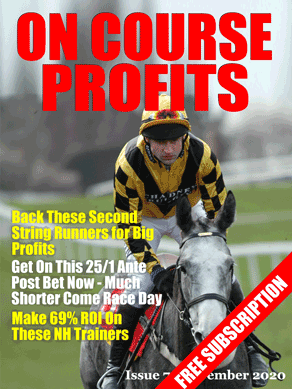 Now we see profit at Bangor, Doncaster, Huntingdon, Kempton, Sandown, Stratford and Uttoxeter (just). Most of the profit comes from the same tracks with the additions having either small volume or small profit. So I'm going to finish off today by telling you that since January 1st 2013 backing all Nicky Henderson hurdlers at Doncaster Kempton and Sandown would have produced a 30% strike rate from 111 bets and a huge 60% return on investment. As they say in the finance adverts past results are not a guarantee of future gains or some such disclaimer, but I will be monitoring the Henderson hurdlers at these courses going forward.